James Wingate Macgregor was born on the 8th November 1867, at Ross Bank, Port Glasgow, Renfrewshire, Scotland. He was the second son of John Macgregor (who himself was the second son of John Macgregor of Finnart and Margaret Fleming) and Sarah Jane Hicks. He emigrated to Canada in 1893 and was in Saint Antoine at the time of the 1901 census. His brother Edwin probably emigrated to Canada in 1890, when his sisters Amy and Ethel emigrated. He became an architect and practiced in Montreal. He identified as a Presbyterian. 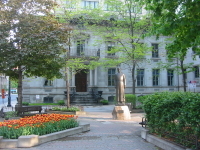 In 1916 he is recorded as living at 407 Dorchester Street West, Montreal, although in 1917 the 5th Beaver Hall Sg, Montreal is also mentioned and in 1918; 394 Dorchester Street West, Montreal is mentioned. He died 17th of March 1934 and was buried at Mount Royal Cemetery.